This is an impressive church – completed and opened in 1839 and designed by Mr Charles Day of London. The building itself is of the Doric order. The exterior was renovated and restored in1997-8 and the interior renovation was completed in 2002-3. The Narthex now includes a glass screen that makes it possible for visitors to sit or kneel and pray there each day. On this present site there was a house and gardens under the jurisdiction of the Jesuit Order. In 1829 after the enactment of the Catholic Emancipation Bill new churches were built including the Jesuit temple in Broad Street designed according to classical Greek traditions. It was in 1837 that the foundation stone of St Francis Xavier’s was laid and the then Queen Victoria sent her personal representative. The church contains a replica of the Tabernacle by Bernini in the Chapel of the Blessed Sacrament in Saint Peter’s Rome. The portico consists of two large columns, each 13 feet in circumference. Presently St Francis Xaviers church is a Roman Catholic Church with masses on Saturday at 6pm and Sunday at 9am. The Benedictines looked after the Parish from Belmont until 1954 when it was handed over to the Archdiocese of Cardiff. In 1992 the Archdiocese asked the Community of Belmont Abbey to once again serve the Church and Parish. Belmont is responsible for many parishes and chaplaincies, whose foundation in Peru and at Belmont are run by a hardworking community following the Rule of St Benedict. Throughout the year the community at Belmont hosts many events such as concerts by world famous musicians, organ recitals and open days with guided tours led by monks and trained volunteers. This may also be worth visiting. However, let us get back to St Francis Xavier’s Church. The Crystal glass dome in the St Francis Xavier’s Church is 60 feet high and fills the church with natural light. The dome has been decorated with 390 gold leaf stars. To the right of the high altar and tabernacle is the reliquary of the hand of martyr Father John Kemble who was hanged when aged 79 in Widemarsh Common in 1679 for practicing his faith as a Roman Catholic priest. The side walls of the church depict the 14 Stations of the Cross the designs of which were first exhibited by a Belgian artist at the Great Exhibition of London in 1851. This is a church well worth visiting and it also may be worthwhile visiting the Belmont Abbey on open days as these two places work so intricately together whilst being some miles apart. St Francis Xavier’s Church: 01432 273485. 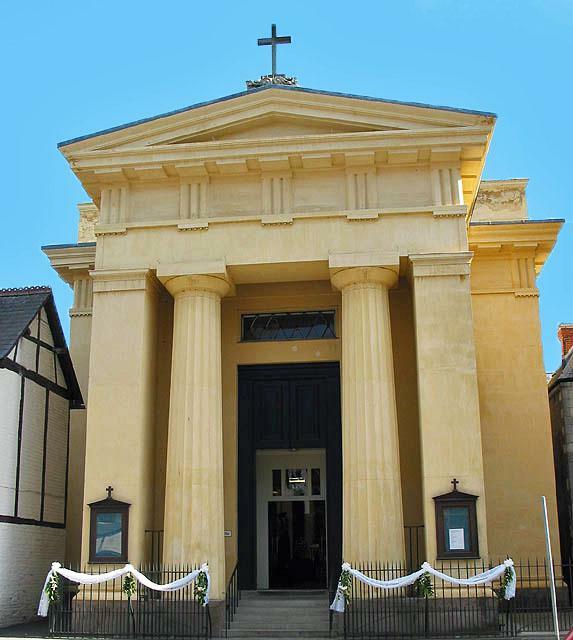 St Francis Xavier’s Church, 19 Broad Street, Hereford, HR4 9AP.